If you’ve attended one of our auctions before, chances are you already know Lori. She does it all – calls bids, runs items, clerks – all while being friendly and attentive to both veteran and novice auction-goers alike. 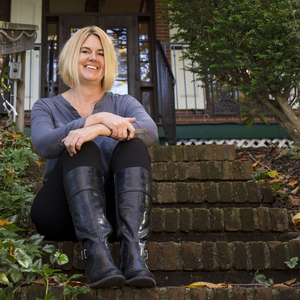 Not only does she work for Briggs Auction both as an auctioneer and the Director of Real Estate, but she’s also the Owner and Innkeeper of Faunbrook Bed & Breakfast in West Chester, PA. Enjoy the following conversation with Lori about auction trends, her background, and finding a tooth. Let’s start at the beginning – how did you end up in the auction business? I started as a kid in the auction business with a family friend’s auction company. They conducted mostly on-site auctions at the seller’s property but they also had their own auction site. I was about ten years old and “running” paper clerking sheets and then eventually clerking. Clearly I caught the auction bug early, so in 2006 my dad and his friend convinced me to obtain my auctioneer’s license. I started working for Briggs Auction, Inc. in 2008 because I wanted a real hands-on position in the auction industry. What does your current position entail? As the Director of Real Estate Sales for Briggs Auction, I am responsible for all aspects of the real estate auction portion of the business which includes the marketing and promotional efforts for these auctions, staffing real estate open houses, conducting the real estate auction, and interacting with many buyers and sellers. I also work all of our Friday night auctions and can call bids, clerk, run items, and manage the online bidding platforms during our bi-weekly auctions and catalog sales. What is your favorite part about the job? My favorite part of my job is interacting with the clients – I love to hear the history of their estates, and from where and how their possessions came to be their possessions! What are some of the trends you’ve noticed in your time at Briggs Auction? The biggest trend in the auction business is the major shift to online auctions. Many auction houses have done away with live auctions completely. I think in some cases, an online auction makes sense for large collections or large items that may not move as easily, but I would miss the buzz and energy of the live auctions if everything was online. I think a lot of buyers feel the same way. What do you think the next big trend in the auction business will be? The market has definitely changed since I’ve been in the business. Although our younger clientele seems less interested in collections or antiques, there is a lot of re-purposing happening as people are more in tune with the environment and recycling efforts. Some of the items that have fallen flat in sales in past years like antique furniture are now more desirable as our buyers will refinish and re-use these pieces. the eco-friendly aspect of our business will keep people coming to the auctions. On the real estate side, many sellers are seeing the benefit of a quicker, as-is sale. Auction is definitely becoming a trendier way to sell property. What are some of the auction pieces and styles that you’ve incorporated into your own home? 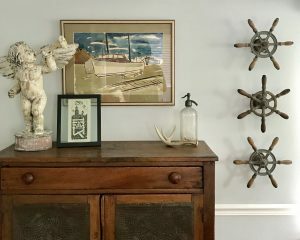 As I own an 1860s home, almost everything I own has come from auction! I think the only thing I ever bought brand new was my own bed. My best auction purchase ever is my 12-foot teak wood dining set and ten chairs – it looks amazing. I have bought a ton of serving pieces, china and kitchen items as well. Lots of fun pieces that you’d never find anywhere else. What pieces do you love to see come through the auction? I love unique items like a carousel horse, or an antique tricycle. Weird stuff that makes for a great conversation piece. What are your suggestions to someone who’s never been to an auction? Why would you encourage someone to attend? An auction can be intimidating to a potential buyer if they’ve never been. Many people have a fear of attending an auction and think that if they blink or turn the wrong way, we will take their bid and they will buy something unintentionally. A good auctioneer would not let this happen! You will find quality merchandise and unique items that you can’t find anywhere else. I always tell people to just come check it out – it doesn’t cost anything to browse, and they may just find something they can’t live without. In your opinion, what is the most unusual piece that Briggs Auction has sold? A gold tooth – I couldn’t believe it ended up here! Show Us How You ‘Briggs Auction’! One of the best parts about working in the auction business is getting to know our many customers and their unique auction style. Certain items speak to certain people, and we’re always so curious to find out what an item’s fate is! In this edition of SOLD!, we take a glimpse at how some of our customers have given their auction finds new life by integrating them into their homes, shops, and ultimately, their lifestyle. Purchased in our June 2018 Fine Estate Auction, this G.W. 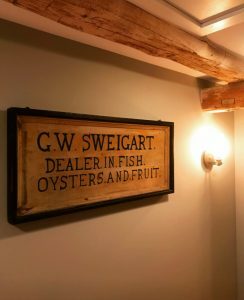 Sweigart sign has found a home in a Chester County farmhouse. 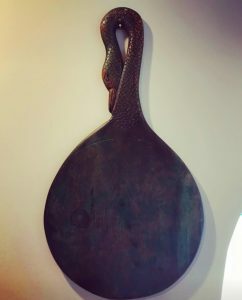 Sold in a more recent auction, this swan-handled cutting board serves as simple and subtle statement piece for a bare kitchen wall. 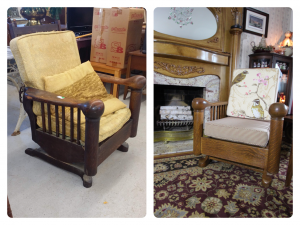 We love before-and-after photos, especially when they feature a stunning transformation like this Morris chair. 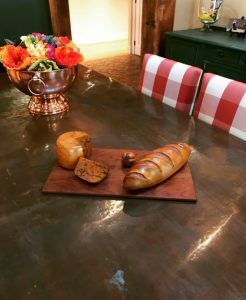 Sold in the June 2018 Fine Estate Auction, this Michelle Holzapfel Bread and Cheese Board found its place at the table, making for a great conversation piece. 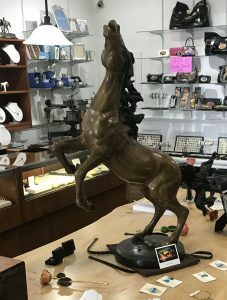 A local shop owner uses this bronze horse sculpture to stylize his offerings. 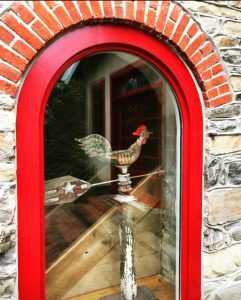 This primitive rooster weathervane has a room with a view – and matches both the interior and exterior style of this local farmhouse. Household items aren’t the only thing that customers swoon over! One bidder told us that he had been looking for this exact model Jeep Grand Cherokee – and found it right here at Briggs Auction. Combining styles is this bidder’s favorite thing to do – the pie safe, cherub, and ship’s wheels blend perfectly in our opinion! Sarah Lockard on Show Us How You ‘Briggs Auction’!